You can understand the need for privacy if you share your dorm room with a college roommate. Even if you like your roommate, you probably don't want to look at each other every single time you're in your dorm room together, do you? Especially if you're trying to study and get easily distracted. That is why college items that help give you a little privacy are essential for your dorm room. But with such a small space available to you, you're going to need privacy that doesn't take up a lot of space. If you have our Don't Look At Me - Privacy Room Divider you can enjoy some personal space without your dorm items taking up your entire dorm room. This college divider is made with small dorm rooms in mind, which is also why we offer this white fabric separate from the frame. Add an extra piece of white privacy fabric to your college essentials just to have on hand in case your original fabric gets messy or add it to your metal frame to create your own personal privacy. 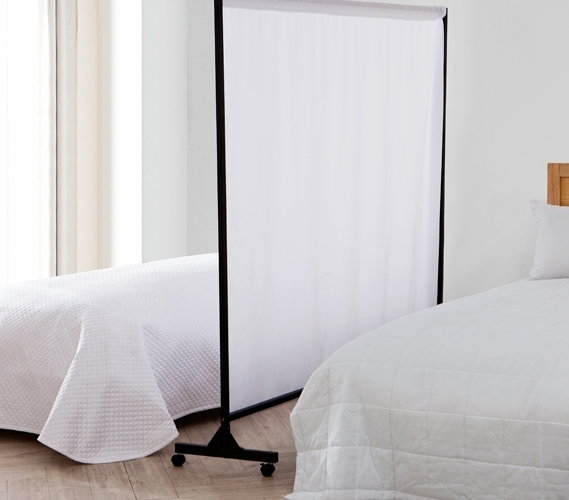 This lightweight white fabric will help give you the privacy you need in your dorm room without taking up too much space.